Closest tubes Bond St., Marble Arch, Oxford St. and Hyde Park Corner. Why vigil on 8 June? Bradley will appear at Fort Meade, Maryland on 6, 7 and 8 June for a further motion hearing. This is one of a series of preliminary hearings taking place between now and September when the Court Martial is scheduled to begin on 21st. The latest defence motions can be read here. Come to the US Embassy in London to show your solidarity with Bradley and to call for his freedom. Bradley is in jail for us, we’re on the streets for him. The vigil will start with a 30 minute silent vigil facing the embassy. This will be followed by a period of reflection. Veterans for Peace UK and London Catholic Worker will be bringing placards and banners but please feel free to bring your own. 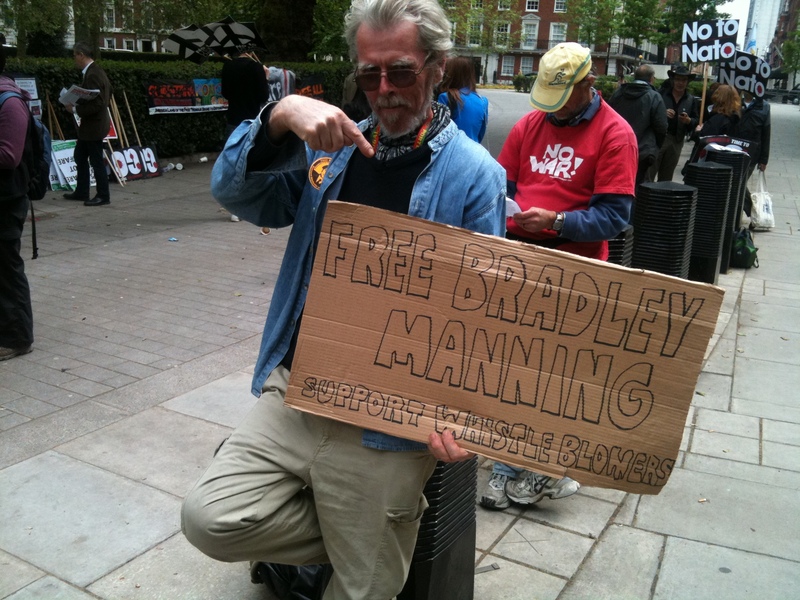 Gallery | This entry was posted in Announcements, Manning and tagged anti-militarism, anti-war, Bradley Manning, call-out, court, London, solidarity, US Embassy. Bookmark the permalink.